Everything children do, see, hear or feel at school is called the curriculum. 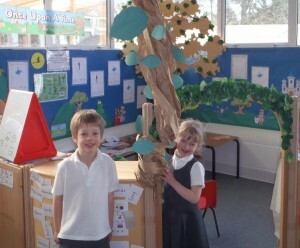 The curriculum for Early Years Foundation Stage (EYFS) sets out the experiences that children should have from birth to the end of their first year in our school. For children starting school, it should look and feel much like they have experienced in nursery or pre-school. It is designed so that children progress smoothly from EYFS into the National Curriculum in Year 1 and on through primary school. During this stage children begin to develop the key learning skills such as listening, speaking, concentration, persistence and learning to work together and co-operate with other children. They also develop early communication, literacy and numeracy skill in preparation for Key Stage 1 of the National Curriculum. There are seven inter-connected areas of learning and development, three of which have been designated as prime areas. Personal, Social and Emotional Development (PSED) involves helping children to develop a positive sense of themselves, and others; to form positive relationships and develop respect for others; to develop social skills and learn how to manage their feelings; to understand appropriate behaviour in groups; and to have confidence in their own abilities.